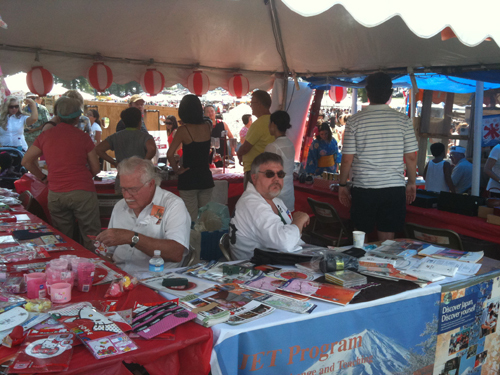 Sunday, 22Aug10, I returned to the Kansas City Ethnic Enrichment Festival, to participate and enjoy myself like I did last year. Friday there had been a gully washer of a storm, but by Sunday it was a typical August day. I got there a little bit early, right before the booths were to officially open, and then helped out the Japan-America Society, a group I’m a member with but don’t have the time to go to a lot of meetings of, by stamping children’s “passports” for a short while. Kendo folk started filtering in, and before I knew it we were lined up behind the stage ready to go. There were about half again as many kendoka participating in the demo this year, from rank beginner up to san-dan, and new-to-bogu to bogu-for-years, so it was a good mix for demo purposes. The number of people participating also meant more time stressing my torn ACL sitting on my knees. I ended up pulling off my knee brace and standing. For my part in the demo I demonstrated kote-men strikes, then sparred with Brian for a bit. It seemed to go pretty quickly this year, and I believe we were well received by the audience. After that I dumped my gear at the JAS booth and then headed out for some food. I wasn’t all that hungry, unfortunately, so I didn’t eat as much as last year. But I got some Scandinavian pancake balls (which I had last year) and a Hebrew sampler plate (which I didn’t), and was satisfied with the variety and quality of what I did eat. 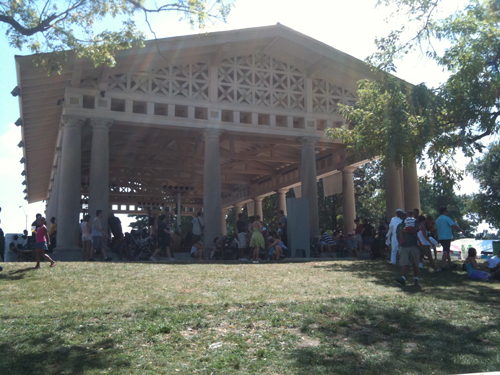 The pavilion at Swope Park. 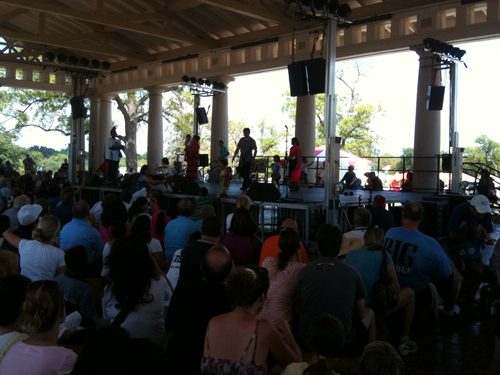 This is the center of the festival and where the demonstration stage is set up. Here were some Thai children, I believe, modeling some traditional costumes or doing a dance. Actually what was really going on was a parent was chasing a small child around the stage, who apparently didn’t really feel like being a celebrity that day. 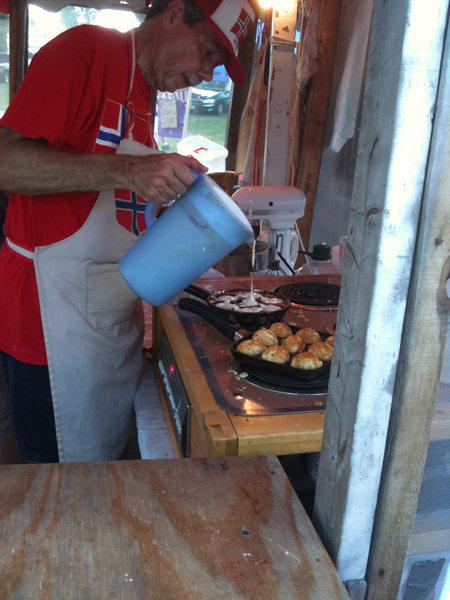 My first stop after the demo was, of course, the pancake ball distributor. 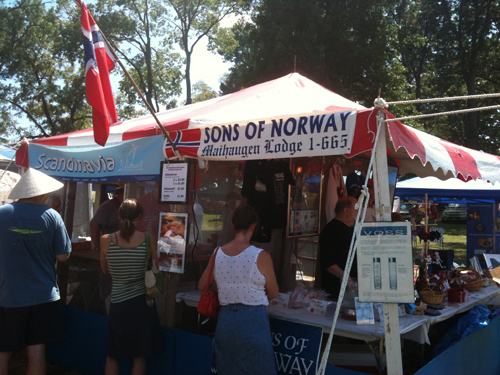 You can find some information on the Sons of Norway at their website, if you’re interested in such things. These things take forever to make (if you’re waiting in line on a hot summer day), and they’re basically spheroid funnel cake type stuff, and maybe overpriced for what you get, but I recommend stopping by and getting a three pack of them. Raspberry sugar drink optional. These sorts of cultural events are interesting for the way people come out to represent their folk or native land. 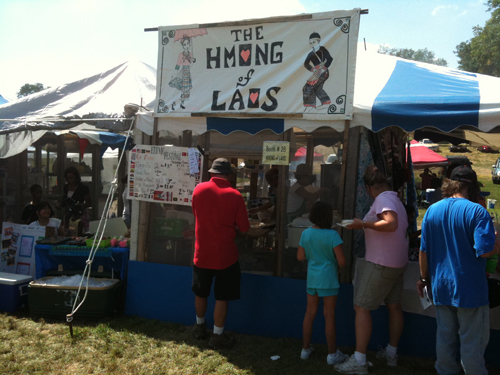 Note that these aren’t “Laotians”, they are “the Hmong of Laos”. In the 1960s the CIA recruited Hmong tribes in the forests and mountains to fight against the communist government, as a sort of side action to the backdrop of the Vietnam War. And since we all know how American adventures in 1960s South East Asia ended up, this explains why this group is both here and pointing out the difference to an American public who otherwise isn’t likely to know. 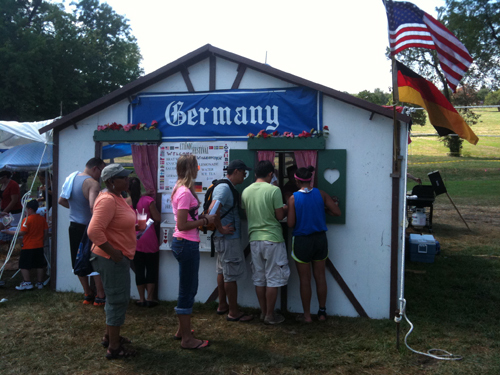 Remember, this is an ethnic festival, not a state festival. Which of course doesn’t stop nationalist concerns from being present. Above is the Republic of China representatives. 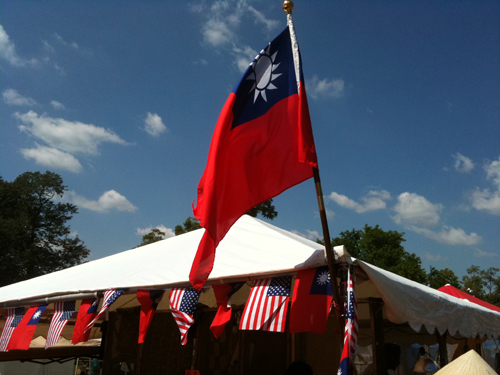 Known more commonly in the States as Taiwan, the ROC is more or less the last vestiges of the holdouts of the nationalists who fought against the communists, retreating from the mainland and holing up on the island province of Taiwan. There’s all sorts of interesting historical and political things going on here, but I won’t go further in depth. 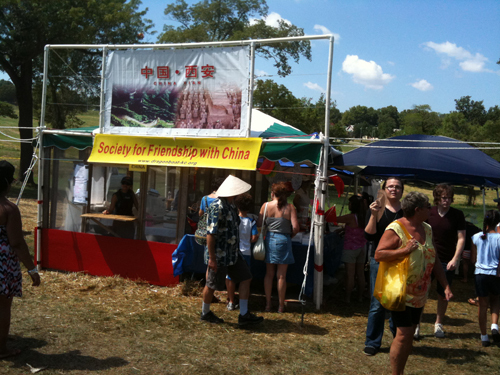 A comfortable distance away was the Society for Friendship with China, representing the mainland People’s Republic of China. Largely Chinese people are ethnic Han (over 90% for both the PRC and the ROC), so what we’ve got here is basically one ethnicity with two booths split along state lines. Though it should be noted that there are scads of ethnic groups that comprise the idea of “Chinese”, the Han group is super dominant culturally, politically and, increasingly, linguistically. 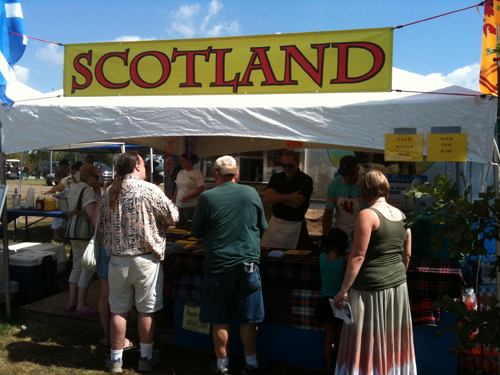 The Scotland booth is disappointing unless you want to buy some meaty dinner. At least it is by Sunday, because I suppose it could be rocking on Fridays and Saturdays. For the enthnicities of the Isles, Scotland and Ireland were represented, but I did not see England or Wales there. Or any Manx or Cornish folk, either, but that’s to be expected, I guess. Germany: blonde girls and sausages. Enough said. Samoans were there representing. 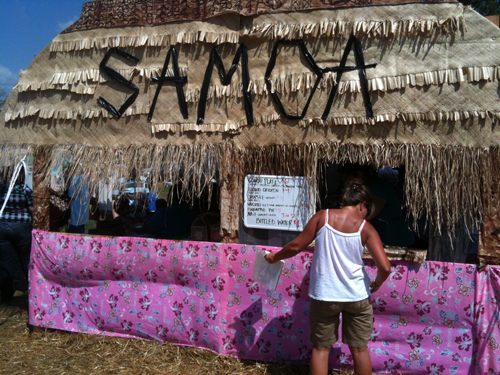 There were other Pacific island ethnic groups too, but the Samoans had the best application of thatching, so that’s the picture I kept. 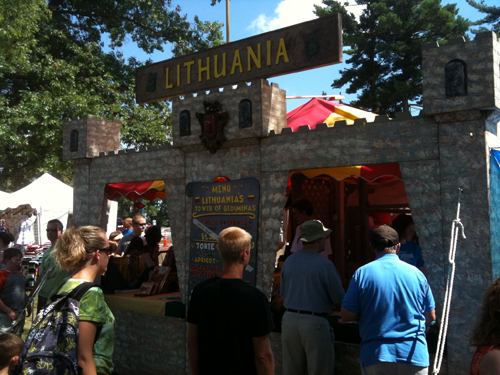 And the Lithuanians brought their own castle! Close by, the Thai folk had an equally impressive construction for their booth, but the pictures didn’t turn out. Jamaica, launching pad for some of the best dance music beats ever! 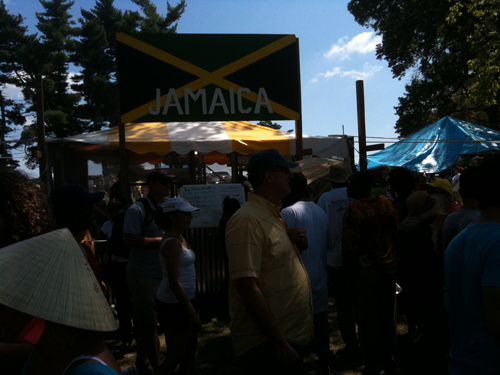 Not into spicy food, though, so I didn’t see the reason to stand in what was the festival’s longest food line. 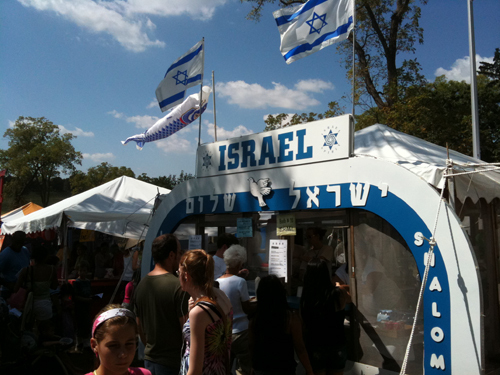 Probably the best food deal at the festival is the Israeli food sampler. I couldn’t tell you what it was I ate, but all of it was very good. 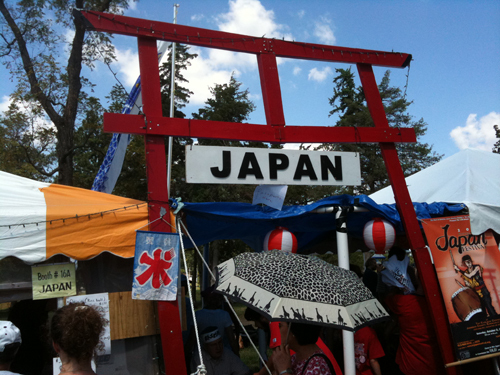 To finish off back where I started, here is the mighty torii of the JAS booth, along with the bloody great wind-sock that towers over the festival booths. The Japanese are one of the ethnic groups that really have their stuff together when it comes to promoting themselves. The JAS always has a great variety of wares to purchase ranging from pop culture to traditional, an array of literature available on things like the JET Program, delicious food to eat and friendly people to chat with. 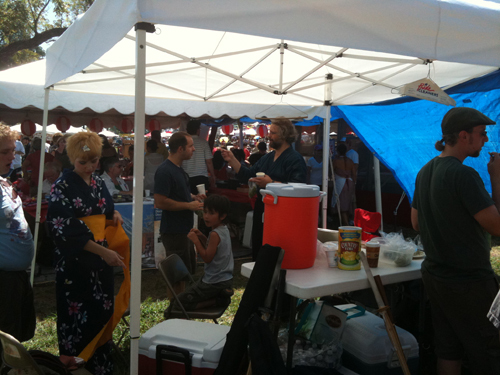 I don’t have pictures this year of the actual demo, but really, just look at last year’s. This year I took just a couple of “behind the scenes” photos of the kendo club after the demo. The JAS, of which several of the club including myself are members of, are always very good to the kendoka. 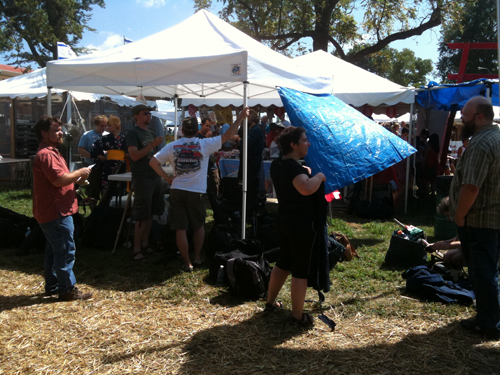 And some more milling around; chatting and putting away our gear, getting ready to wander the festival with our friends and families. And finally there were these things. 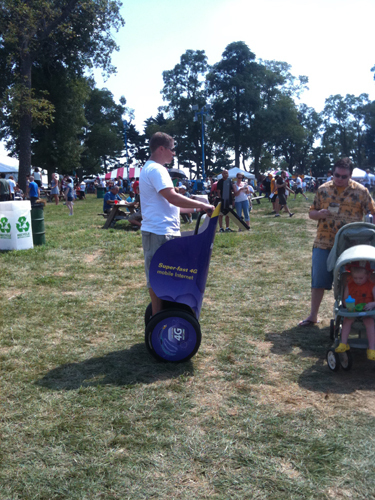 The festival is sponsored by a local communications service provider, so they had these weird cyborg beings rolling around the festival proffering terminals you could use to… I don’t know, really. They made me nervous, and this was as close as I would get to photograph one. You don’t want to antagonize cyborgs, because being part-human they have a natural blood-lust that you don’t want to accidentally awaken. That’s all! I strongly encourage everyone who lives in the Greater Metro to go to one of these festivals, either as an attendant or as a volunteer for the cultural group of your choice. It’s a fun experience!